Which operator has the world’s highest data usage? Which operator carries the most data traffic in the world? Which operator earns the most – or the least – per GB? This is tefficient’s 22nd public analysis on the development and drivers of mobile data. We have ranked 90 reporting or reported operators based on average data usage per SIM, total data traffic and revenue per gigabyte in 2018. 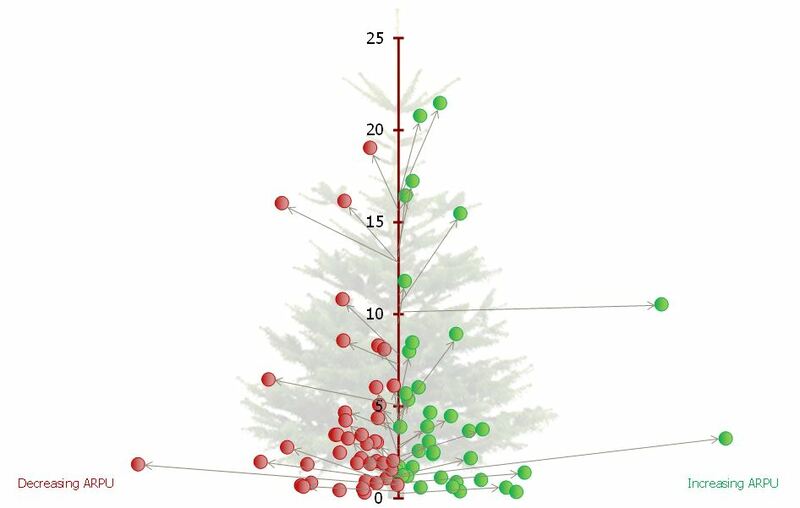 The data usage per SIM grew for all operators; everybody climbed the Christmas tree. 46% of operators could turn that data usage growth into ARPU growth – 54% could not. Read our analysis to see who delivered on “more for more” and who floated with the “more for less” stream. Previous PostChina and India shift to 4th gear – leave many mature markets in the dustNext PostAre fast networks fast because they aren’t used?